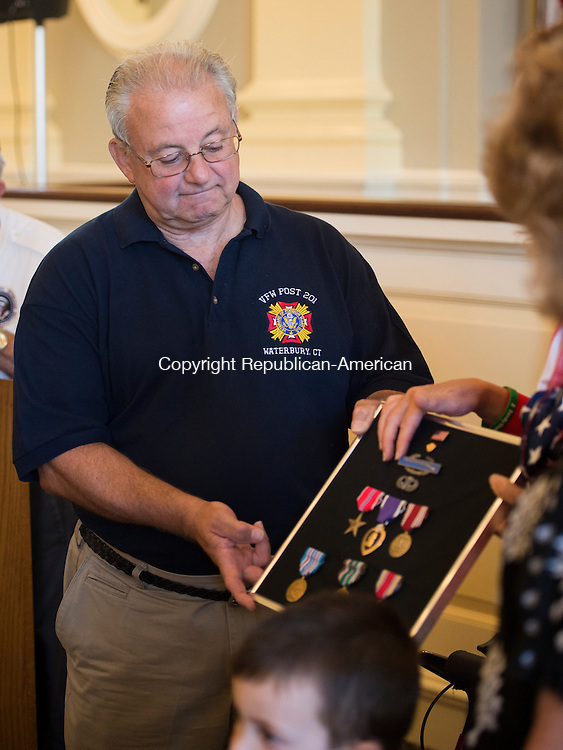 WATERBURY, CT - 26 August 2015-082615EC01-- Vincent DiDominzio, Jr., accepts WWII medals on his deceased father's behalf Wednesday night at Waterbury City Hall. Vincent Didominzio Sr., posthumously received the Bronze Star, the Purple Heart, the Good Conduct Medal and the American Campaign Medal. The new medals were secured by Congresswoman Elizabeth Esty after the family reached out to the local V.F.W. post to help replace the missing ones. Erin Covey Republican-American.